17/04/2016 - Paolo Ruberti had a great start of the season in the 6 Hours of Silverstone, first round of FIA WEC 2016. The driver from Verona claimed a deserved third place and the first important points of the season in category LMGTE AM at the wheel of the number 50 Chevrolet Corvette C7 run by Larbre Competition. The British weekend has been quite challenging, especially as weather conditions spoiled Friday and Saturday, as the third free practice session was canceled due to an unforeseen snow fall. In the first two sessions run on humid tarmac, Ruberti, Ragues (FRA) and Yamagishi (JAP) confirmed the good feeling of the eve marking interesting times and improving all the time. The Corvette C7 has been a great protagonist of qualifying. Ruberti put in an impressive best lap of 2'14.044, that was the fourth time of GTE cars and quite solidly ahead of all AM cars. 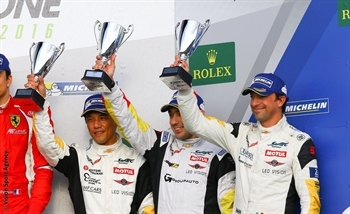 The average performance obtained by the rookie gentleman driver Yamagishi earned the lineup a positive third place on the grid. The race started with the sun on dry tarmac but with cold temperatures. Ragues run the first stint of the race before handing the car over to Yamagishi and then to Ruberti. The Italian driver kept a remarkable race pace in line with that of PRO lineups. The safety car deployment in a crucial stage of the race penalized the Larbre Competition lineup that lost one lap compared to the category rivals and made them slip down to P5. The Italian driver was back behind the wheel of the Chevrolet Corvette C7 for the crucial final stint. Ruberti put in a series of fast laps thanks to his experience and driving effectiveness, getting one position back. A technical problem slowing down the number 88 Porsche 911 RSR eventually gave him the third step of the podium. "We are happy for this podium, especially as it came in the challenging season opener. The car confirmed the potential shown in testing and the race pace has been great. Some episodes penalized us during the race, but we lapped anyway on very good times and the competitiveness shown so far is a good base for the future. Some lineups have experienced bronze drivers, but we will give our best to be protagonists". The FIA WEC 2016 will resume with the 6 Hours of Spa Francorchamps next 6 - 8 May.